World Language Initiative - Montana: Eat Mackenzie River Pizza on Wed., Feb. 21st and support world language k-5 scholarships and 2018 summer camps! 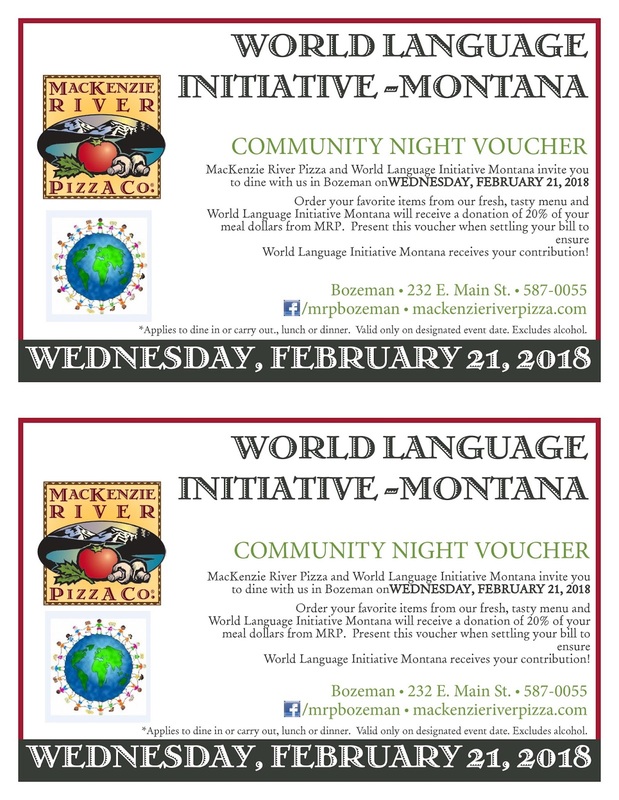 Eat Mackenzie River Pizza on Wed., Feb. 21st and support world language k-5 scholarships and 2018 summer camps! Print or show this voucher on Wed. Feb. 21st at Mackenzie River Pizza! Eating out will help WLI-MT increase their level of world language k-5 after-school scholarships for 2018-19 and launch our 2018 Summer Camps (in French, Spanish and Chinese)!